Ripe red fruit peeled and sliced. In the big dutch oven Sugar added. Stir in the cinnamon. Squeeze in a lemon. Finally thickened. I can hardly wait. Ladled into jars. Rolled stick of cinnamon added. Summer sealed up to enjoy on my toast all winter long. Some to enjoy right now, and a jar for you, too. Promise, I can hardly wait to see your face if you’ve never tasted tomatoes this way! Sadly, Gram failed to leave her recipe behind. She cooked alot by throwing a handful of this and a pinch of that into the pot. Tomato preserves were no exception. 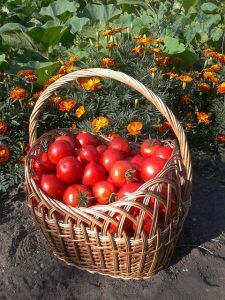 Isabelle at the blog, “Crumb,” shares her recipe for Tomato Preserves. It’s the closest I’ve found to how I remember Gram making it, and it’s the recipe we’re using at The Coffee Cottage. Our customers love it served with cream cheese and bagels. There’s a moral here: memories of treats mom and grandma made are special! Lynn and her daughter searched for years for one recipe from Lynn’s mom. Fortunately, it was hiding under their noses and was finally recovered — a story for another time. With that said, intentionally preserve favorite recipes for your children and grandchildren. With so many tools — both virtual and hardcopy — it’s so easy to do. Include a favorite Scripture verse with each recipe. Your legacy will be richer for it. ©2018 Lynn U Watson. All rights reserved.